Rabbi Ze'ev Karov, spokesman for the Hesder yeshivas, criticized MK Elazar Stern (Hatnua) in an interview with Arutz Sheva. 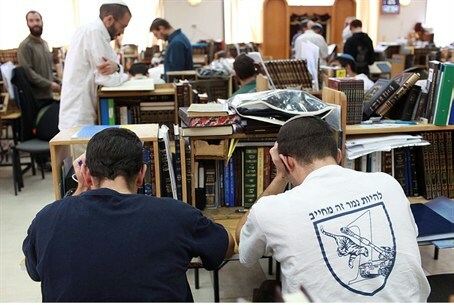 MK Stern recently told Arutz Sheva that the religious-Zionist community would be “unfortunate” without the hesder system, which allows young men to combine Torah study and army service in a five-year program. However, he added, “Let's be honest with ourselves: there are not even 1400 students per year, or even 900 left after completing their 16-month army [portion of the] service, who really keep Torah as they should be… I am against lengthening the service time but for increasing the numbers in their ranks." He also suggested that many hesder students fail to maintain a rigorous schedule, saying, “How many parents ask me why their child's Rabbi lets them leave for Yeshiva on Monday, and return on Wednesday [instead of a full week]?" MK Stern is deliberately misrepresenting the truth, Rabbi Karov accused. “He’s using numbers dishonestly and he knows it. It’s true that 1,400 register for hesder at the beginning of the year, but after six months or a year some of them realize it’s not for them, and enlist for a full term of service,” he said. He disagreed with Stern’s criticism of the fact that yeshivas let the students take breaks for Jewish holidays, while combat soldiers remain on duty. “There’s such a thing as leave from the army, too,” he said. Rabbi Karov rejected Stern’s claim that many hesder students either work or pursue a degree during the time they are supposed to be learning Torah. A handful of students do so, he said, but hesder rabbis certainly do not encourage it, and have sent students who are caught skipping hesder studies back to the army. Stern himself asked during his interview how it happened that MK Ayelet Shaked, who does not consider herself religious, has ended up defending the hesder yeshivas, while he, who wears a kippah (identifying him as an orthodox Jew – ed.) is on the other side. “Apparently, the kippah on the head isn’t proof of much,” Rabbi Karov answered. Stern recently faced heavy criticism from within the religious-Zionist community for accusing Rabbi Dov Lior, the Chief Rabbi of Kiryat Arba-Hevron, of racism. Stern now says that he will remove his parliamentary immunity in order to allow Rabbi Lior to sue him for slander.